ArielVision is an affordable, easy-to-use, photorealistic rendering extension for Trimble SketchUp 2018 or earlier. IRender nXt costs just a bit more, but includes advanced features that improve workflow and provide more rendering options. We encourage you to review this features comparison. How should I decide which Renderer to try and purchase? If you want to have all the high-end features available – even if you don’t use them right away, then you should choose IRender nXt. If you want to create better hi-res images from your SketchUp model, but don’t want to have to learn how to use advanced rendering features – like Depth-of-Field, Special Reflection Settings, Special Transparency Settings, etc. then ArielVision is the right choice for you. If you are using SketchUp and Rendering as part of your professional offering, and are using it to increase or support your business, then IRender nXt should fit within your budget. If cost is your primary concern, then ArielVision may be the right choice for you. 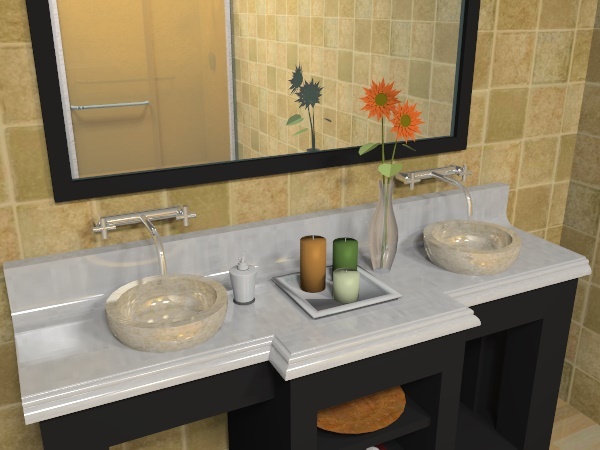 This interior scene was created by downloading a vanity, mirror and shower stall from the 3D Warehouse, right clicking on materials to set reflection and placing ceiling lights in the ceiling. This rendering took less than 1 minute to complete. All renderings settings – reflection, lights, etc. – are stored in you SketchUp model and the rendering is created with a single click on the ArielVision Toolbar – which starts the rendering. You can return to the model and re-render it without having to define materials and lights or make make other renderings settings – everything is remembered and stored in the model. Downloads – you can download a copy from: Downloads Page – Select ArielVision. Trial Version – ArielVision should automatically run in trial version, and if you have previously tested our rendering products, you should get a new trial version for ArielVision. ArielVision gets its rendering information from SketchUp materials. colors, transparency and textures are set normally in SketchUp and used for rendering. Reflection and Glow settings are assigned to materials by right clicking on any surface which already contains the material, and setting the properties. (You do not have to drill into groups and components. ArielVision will automatically find the proper material for you. ArielVision can render the scene using as many rendering passes as desired. (Rendering passes use additional lighting samples from the sun, sky, and lights to make smoother shadows and more realistic effects. Initially, while you are learning, a limit of 40 passes is used. Later you can increase the number of passes as desired. You can render at any resolution or render quality desired. Higher resolutions and higher render quality takes more time per pass and more time for the complete rendering. Initially, ArielVision is set to use a medium resolution so you can preview your model quickly and increase the resolution later if desired. ArielVision defines material properties and rendering settings inside of SketchUp and saves them in you SketchUp model. One button click is all that is necessary to create and view the rendering. There are additional settings for HDRi skies (360 degree, images which enhanced illunination and brightness information stored in the image), and for other background images. Top Quality PhotoRealistic Rendering Engine. Laptop seat – second license for use on your laptop. Automatic use of multi-processor and multi-core CPUs.